We LOVE pesto!! 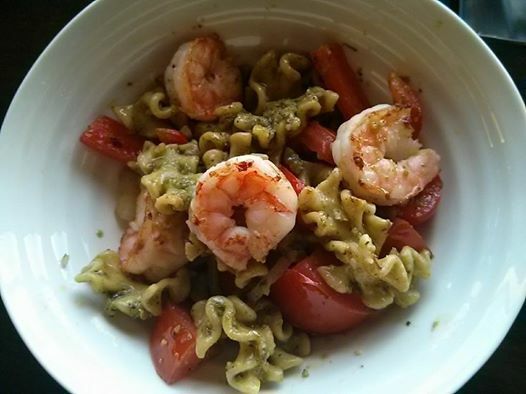 On tonight’s menu is pesto and prawns! This is an easy and fast meal with delicious homemade pesto. In food processor or blender, combine almonds (or pinenuts, etc) and cheese and process until roughly ground (or finely if you prefer). Add the garlic, salt, basil and EVOO, process until smooth (about 15-20 seconds or to desired consistency). Add more cheese, salt or garlic to taste. For an extra garlicky taste we sometimes substitute part of the EVOO for Olive Us Garlic olive oil! Create your own favorite and share it with Olive Us or keep it simple with this easy recipe! Cook pasta according to directions on package. Drain pasta. Toss in some pesto & any extras you may want, such as cooked chicken, roasted veggies, prawns, spicy sausage, etc. In the picture we used Lemon Parsley Mafaldine pasta and added some seared prawns with sautéed onions and red peppers. Delicious! !